Stuart's Bikes supply second hand bicycles through out the Oxford area - we give bicycles a second chance! 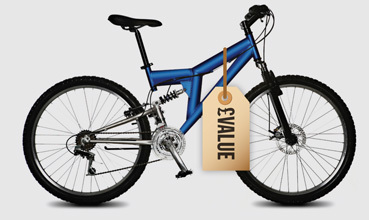 We source our bicycles from bona fide auctions & suppliers buying a mix of quality from 'as new' to 'second hand bicycles' and 'bikes for spares'. The cycles we offer are then fully serviced to work as new again. This will include stripping and servicing gears, bearings, brakes, cables and tyres. Any worn or damaged parts are replaced. Finally all bikes are thoroughly cleaned, greased and oiled. We have bikes for any budget that are very suitable for Oxford Students. We frequently stock all styles of bicycles such as mountain bikes, hybrids, racers and road bikes. Some of the brands we have had in stock include; Raleigh, Trek, Kona, Diamondback, Saracen, Carrera, Dawes, Apollo and many more. Check our 'latest bikes added' or call now to find out what we have in stock. If you can't find what you are after on this website or wish for more information on any bike please call us on 07889 050494 to discuss your needs. I also offer a free weekly delivery to Oxford, call for details. Just look at our 'before & after' shot below (click image for big image). All our bikes are given an above average service before they are sold. We go above an beyond the regulations for second hand bike sales and all of our bikes are sold 'ready to ride'. For more information please call 07889 050494.